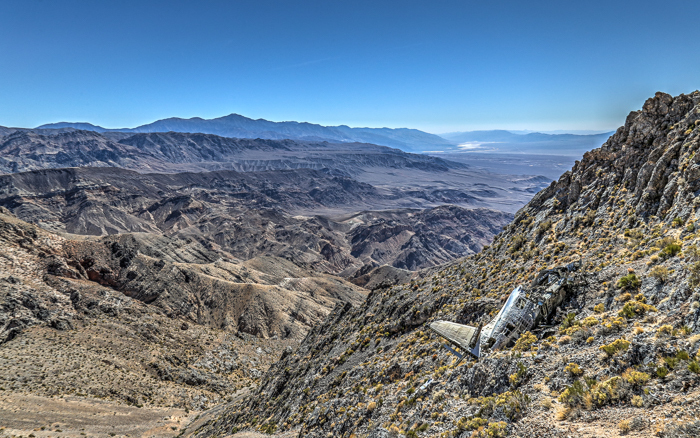 The fuselage of the SA-16 Albatross plane wreck has rested against this mountain near Towne Peak overlooking the Panamint Valley. 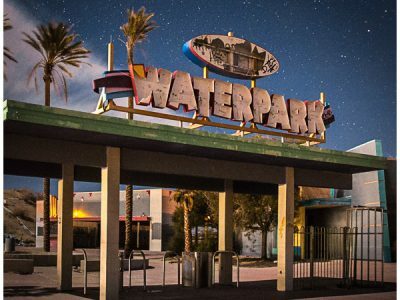 The crash occurred several miles away from where the six occupants made an emergency evacuation on a January night in 1952. On the day of January 24th, 1952, a Grumman SA-16 Albatross took off from Mountain Home Air Force Base in Idaho bound for San Diego carrying a 6 total occupants. The one-day, non-stop flight was part of a classified training mission supporting CIA Cold War operations. As night engulfed the skies around 6:30pm, one of the Albatross’ dual engines gave out. 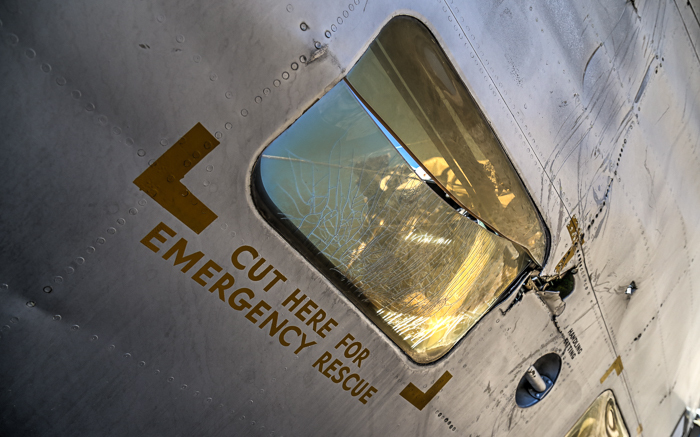 Losing elevation and velocity, the pilot gave the order for the plane to be evacuated. 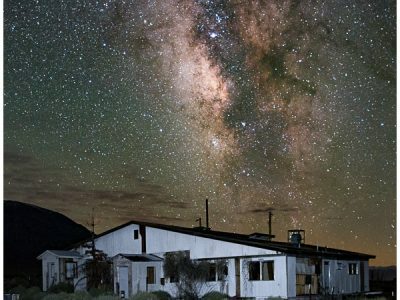 All of those onboard would jump from the rear door and land about 14 miles north of Death Valley’s Furnace Creek with no injuries, while the now-unmanned plane would eventually crash into a mountain near Towne Peak in the Panamint Mountains that formed Death Valley’s western edge. 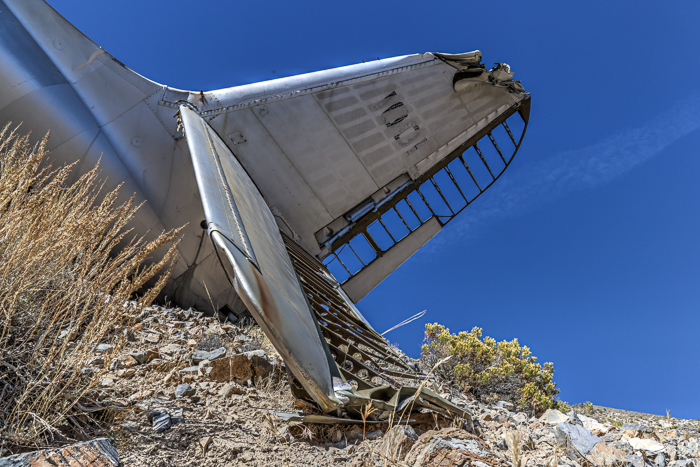 Being a classified flight, the crew members were eventually picked up by military aircraft, and the sensitive materials at the wreck site would be collected and removed. The bulk of the wreck, however, was deemed too remote to be removed, and was ultimately abandoned in the high steep mountainside above Dolomite Canyon. 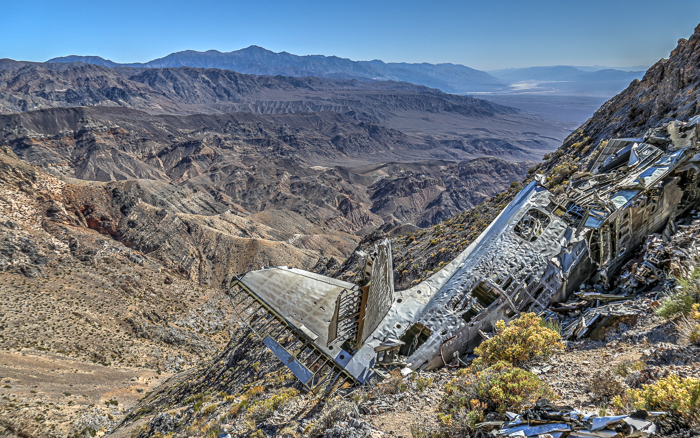 The plane wreck site remains, storms and gravity having pulled much of the debris deep into the canyons beneath. 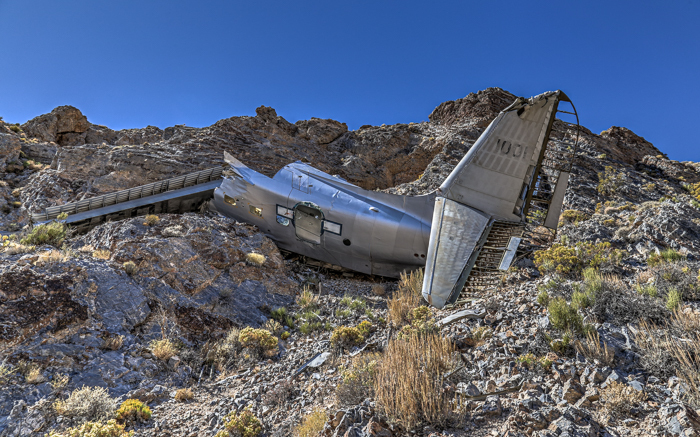 But the fuselage and one of the plane’s engines remain, clinging to the side of the mountain. 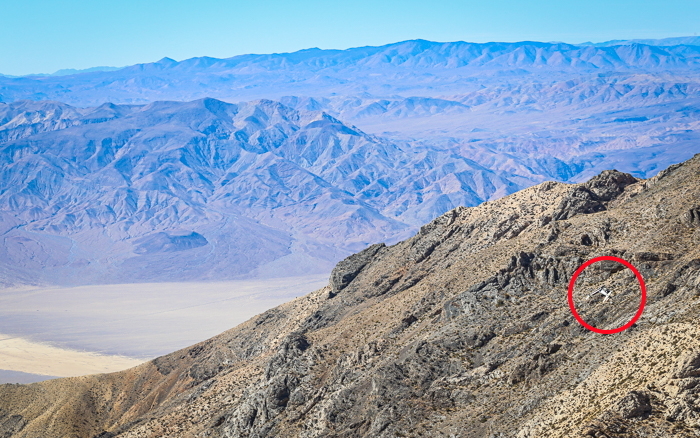 It is possible to reach the wreck by foot, though the route requires scaling a trail-less series of mountain summits, and Death Valley’s extreme conditions ensure that would-be visitors remain absent for months of the year. In total, a 10 mile round trip hike with around 4000′ of total elevation gain along its length keep the wreck beyond the ability of most. 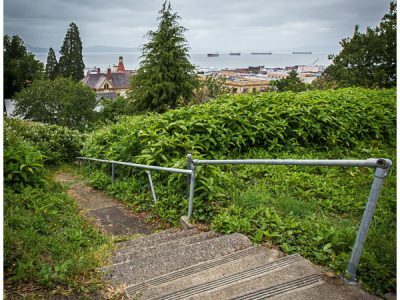 Its location deemed too remote for removal, the plane wreck site is accessible by a 10 mile hike requiring around 4000′ of total elevation gain over its length. 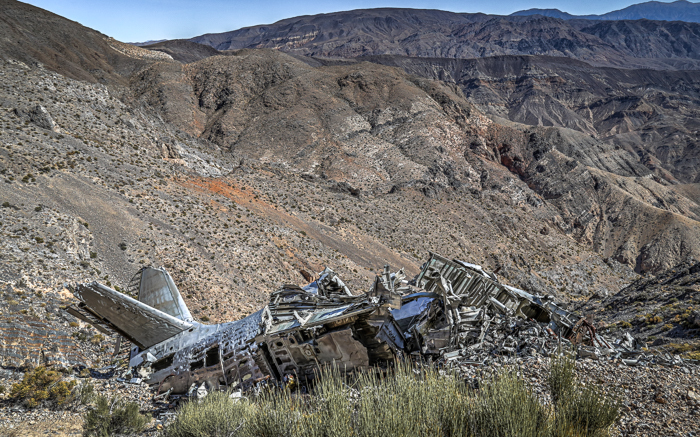 The plane wreck has remained off of any official Death Valley National Park maps. While the wreck is visible from certain points of Highway 190 if you know where to look, it is generally left alone on its mountain perch. 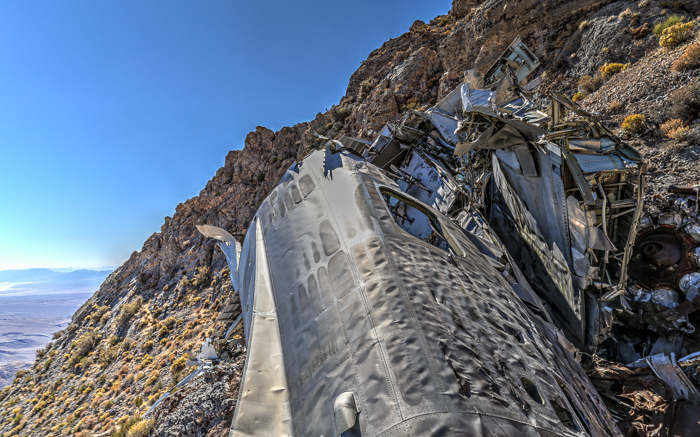 The rear end of the fuselage remains relatively intact while the front end lies scattered among the mountainside and in the steep canyon below. SA-16 Albatross CIA training flight: Crashed January 24th, 1952.